Have you ever been at a party where an event caricature artist was at work? Odds are, there was a crowd gathered around, excited and happy, watching the artist create a fun & fast sketch of their friend or family member. There are so many creative party ideas that include caricature art! And the fact that your guests walk away with a souvenir? Bonus! If you’re planning an event and looking for creative party ideas, here are five ways you use caricature art to WOW your guests. Add a touch of whimsy to your invitation by using custom caricature art in your invitations. Capture the personality of your guest of honor by asking the artist to include items related to their hobbies and interests. By exaggerating someone’s unique features, the artist creates an image that allows us all to poke fun at ourselves, which is why so many people enjoy it. It’s even more fun when your guests can gather around and watch as their friend or family member’s “goofy face” is created. 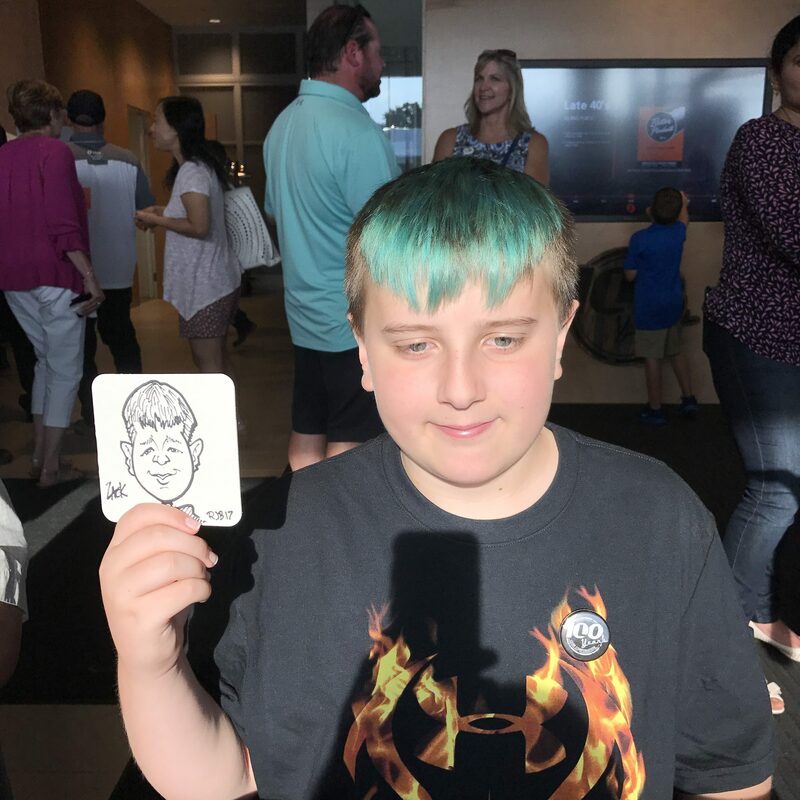 Consider hiring one or more traditional caricature artists to entertain your guests during your party and they’ll get a personalized memento to remember it by, too. At Goofy Faces, we also offer an update to traditional caricature style – live digital caricatures. We call them eSketches™ and our customers have given us great feedback on this high-tech approach. 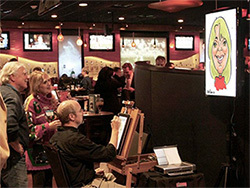 The artist works on an digital tablet and your guests watch them create the image on a big screen nearby. The images are then printed instantly on photo paper and given to your guests. We also offer a link to download all the finished eSketches™ following the event! We promise, your guests will love caricature coasters! They’re small and quick – it only takes the artist about two minutes to draw the image. Plus, the 4” x 4” heavy cardboard drinking coaster can be customized with graphics and text, so people will always remember where they got their mini piece of art. Even if you’re throwing the party, you can still bring the most creative and memorable gift. And how better to celebrate the guest of honor than to have an artist capture them in a piece of custom caricature art that you can have framed for their home or office? Many of our loyal customers come to us repeatedly to have us capture images of the people they love, along with their interests, almamater, hobbies and other personal items. It makes a lasting and memorable gift. Check out the latest episode of Art Detroit where Shiela Grant sits down with me to discuss everything that is the art of caricature! Introducing Remote eSketches™ from Goofy Faces! If you have internet, you can now book a live artist anywhere on the planet. 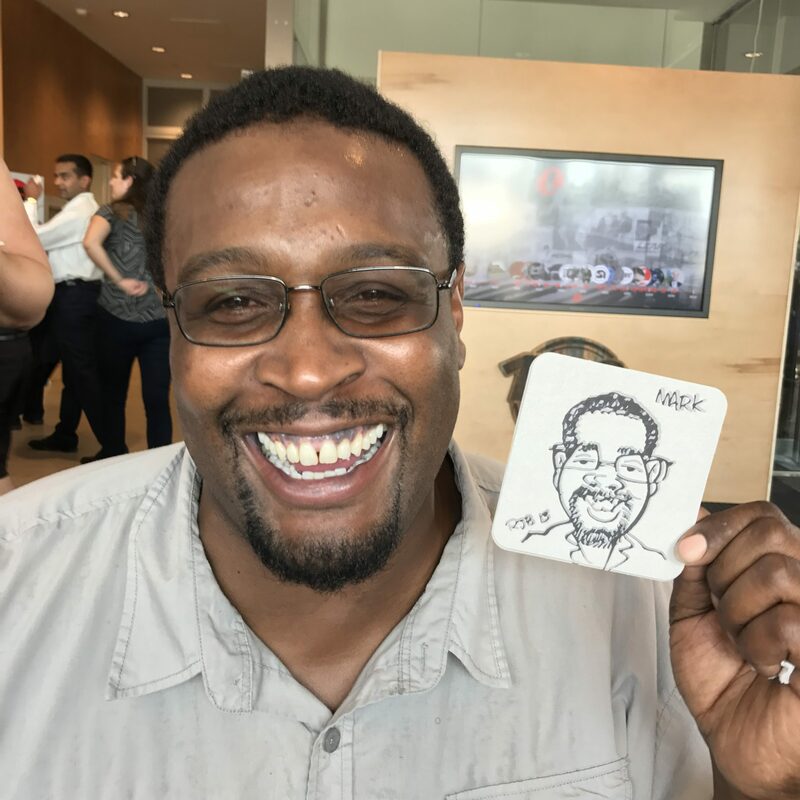 Book a Remote eSketch Artist for your trade show booth, corporate function, grand opening or any event where you want the impact of live digital caricatures without the high cost of bringing the artist to you. All you need is a laptop, tablet or smartphone with internet access as well as a color printer and you can enjoy having an artist draw your guests and customers live at your next event. 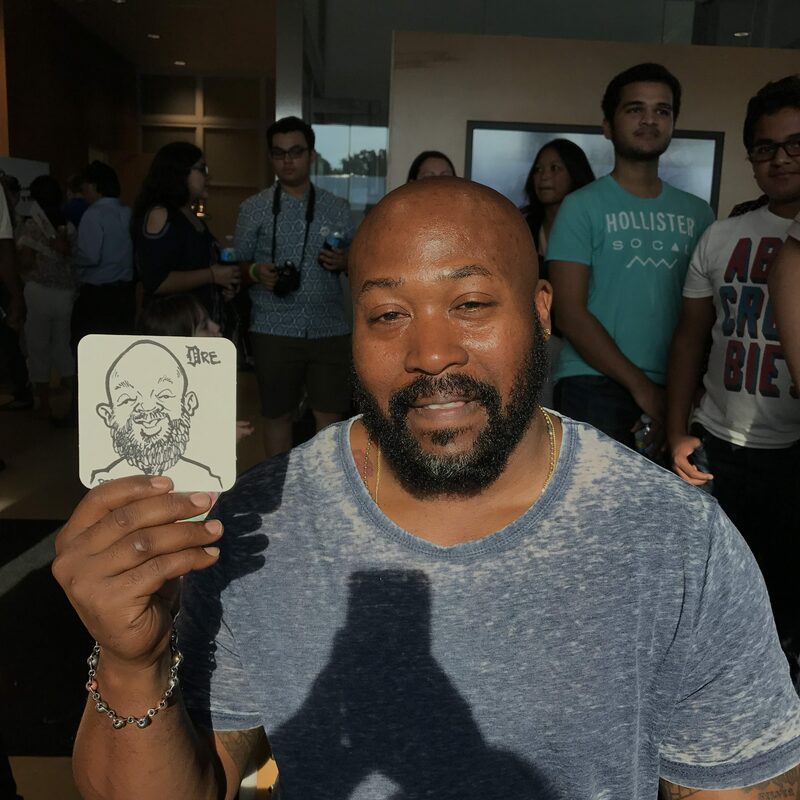 Our artist engages and interacts with your guests just like in person while drawing their digital caricature in as little as 6 minutes. After showing your guest their finished caricature, the artist simply uploads the final art to a Dropbox, instantly so you can access it from your device to view and print at your location! So the next time you want to add a unique form of hi-tech entertainment to your event, why not try our Remote eSketches™? Contact us for a quote! Most people consider caricatures more whimsical than practical. As beloved as the art form is by those who appreciate an exaggerated portrait, it isn’t exactly an integral part of most business plans. Few think a caricature might help land the next big deal, and most business-minded folks consider it a simple amusement that belongs on family trips to the theme park, nowhere near the corporate conference room. This thinking is rapidly changing, however, as a growing number of businesses are taking advantage of this unique service in a truly practical business application in the corporate world. 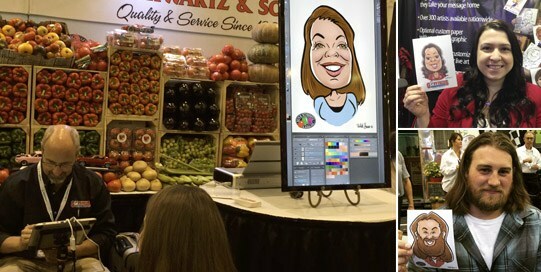 Live digital caricatures, specifically those performed on-site at trade shows and industry conventions, are becoming increasingly popular as a practical service for generating draw to brand messaging, products, and services displayed in trade show booths and exhibits. While it may be difficult to see the practical value of this at first glance, it’s difficult to deny once examined. Due to its unique nature, this practical application is also arguably superior to many of the other self-promotional goods and giveaways that corporations and brands routinely spend healthy budgets on when trying to gain attention from prospective customers at B2B events. According to the 2012 study “The Economic Significance of Meetings to the U.S. Economy” published by PricewaterhousCoopers LLP, there were 273,700 industry conventions and 10,900 trade shows in the United States alone in 2012. The trade show and convention industry is undoubtedly a necessary part of the fabric of B2B commerce in the world, so it’s no wonder that so much money is spent preparing for these events: $280 billion dollars spent in direct spending related to corporate functions in 2012 alone. B2B is difficult because unlike direct-to-consumer marketing, businesses are harder to advertise to by traditional means. This is why trade shows are so vital. At trade shows, corporations and brands are able to erect temporary storefronts on the trade show floor allowing them to network with their prospects like traditional face-to-face customers. But gaining attention for more than a few seconds can be daunting with a showroom full of competition all vying for your prospect’s attention. That’s why nearly all booths and exhibits provide some form of a giveaway to help draw in guests for a longer chat. Common giveaways are mugs, keychains, t-shirts, USB drives, pens and the like. Occasionally, businesses get a little more creative, offering something more exotic like a free back massage. The challenge is finding something that 1) creates real draw to a trade show booth, 2) advertises for the brand, 3) creates a real opportunity for customer engagement (i.e., time), and 4) is personalized enough to create real impact. Live digital caricatures are one of a few services that actually meet all of these criteria. So what exactly are live digital caricatures? Like traditional marker-on-paper caricatures, digital caricatures are drawn on location by hand. The difference is that digital caricatures are drawn on a digital tablet and displayed on one or more large-screen monitors. The large screens both entertain passersby and pull people in who want a caricature. This allows real, natural engagement to occur between the person being sketched and the booth attendants representing the sponsoring brand. Also, those waiting in line are engaging the brand too and creating networking opportunities. After the sketch is completed, it is printed out and often provided to the guest as a name tag lanyard which the guest wears for the duration of the convention. Guests become voluntary walking advertisements for the sponsoring brand since a full color logo is included on every sketch. Unlike nearly every other giveaway, sponsoring brands get a bang for the buck at several key stages of customer engagement while creating a growing awareness of their brand. This includes following up after the show ends. Companies can post all the digital caricatures drawn by their artist to social media and their website for more engagement opportunities. For brands looking for a good way to create draw to their trade show booths, engage prospects once there, and leave them with a giveaway unlikely to end up in the trash, live digital caricatures may be something for companies to consider. 12 years ago, I decided to make a full-time business out of drawing caricatures for a living. This was no small task. Very few people make their entire living based on the art of caricature but I already wasn’t making enough as a freelance artist to support a family and the idea of working a full-time job was too depressing to consider. So, I took a breath and dove right in. One of the first places I decided to try out was at our local annual art festival in Rochester, MI called Art & Apples. It’s been around for 50 years and was close enough to my home to risk seeing if I could make it work. The first year was in 2004 and I didn’t even own a tent. However, me and fellow artist, Ben Pierrot stayed busy enough over the 3-day weekend to come back the following year. The next year, I had a tent and my business grew. Then I started opening other caricature stands in different locations throughout the U.S. I have had as many as 9 retail stands coast to coast over the past 12 years. And each year, I would return as a sponsor at Art & Apples and each September, another artist and me would draw for 3 straight days. We became a crowd favorite at the festival. Customers looked forward to seeing us each September and we became a tradition. Heck, 2 years ago, I drew a couple at the festival who decided to hire 3 of us to draw at the wedding. A year later they came back to Art & Apples for another caricature. This time, they wanted one showing that the couple was expecting their first child! They handed me an envelope that showed if it was going to be a boy or a girl. “Whatever you do, don’t tell us! We want it to be a surprise until next week when we use your caricature for the official announcement.” There were many special moments like that one. I always looked forward to drawing friends and family each September. I enjoyed working with several different artists over the years. We always had fun even though we weren’t making a fortune. I was always able to cover all my costs and pay my artists who helped out. That, plus the annual exposure, justified all our efforts. Unfortunately, all that changed in 2016. Paint Creek Center for the Arts, the organization that runs Art & Apples, decided to raise their sponsorship fee by 120%! I have paid a bit more over the previous 12 years but I had never seen a hike like that. I asked if there was any way we could work out a better rate but they refused so, sad to say, 2016 will be the first time in 12 years that Goofy Faces will not be at Art Apples. It makes me very sad because not only did I always look forward to drawing in my hometown but I liked the spirit of community I felt from my involvement with the local festival. Even though we have caricature stands in Chicago, Los Angeles, Denver and other locations around the country, I considered Art & apples to be the place where it all started. And sadly, 2016 is the year where it ended. It was a great run. If you are a regular customer of ours from Art & Apples, you can order your caricatures online at www.goofyfaces.com/shop. If I find another local festival to set up at, I will keep you posted. Over the years, Goofy Faces has had the good fortune to be involved with many great and interesting causes and movements. This Spring was no exception. 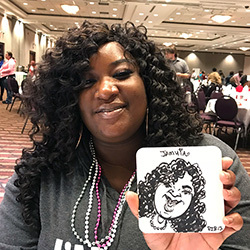 The Kent County Youth Summit hired 6 artists from Goofy Faces to draw middle school and high school students while they attended the 5th annual Youth Summit which took place at the Devos Place Convention Center in Grand Rapids, MI. This year’s theme, Be the Hero, is a declaration of the collective power of this generation to take a stand as everyday heroes and to drive positive change in their community, while transforming health and wellness trends and overcoming pop culture messages that suggest that alcohol, tobacco and other drugs are not harmful. To help celebrate this point, the Summit asked Goofy Faces to draw as many heroes as they could in 4 hours during the youth summit on May 6th. To help achieve this goal, Goofy Faces provided 6 artists and 2 predawn templates of super heroes to help speed up the drawing process. The results were hundreds of happy teens who enjoyed posing for their super hero caricatures during the summit! In case you haven’t heard, Goofy Faces offers eSketches™ nationwide and they are becoming more and more popular each month. “What are eSketches™”, you ask? Good question. 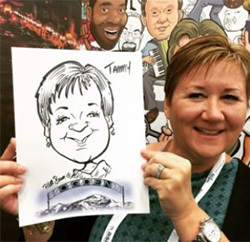 eSketches™ are caricatures that are drawn & colored digitally live at events, trade shows and parties. Our artists use a digital drawing tablet to work their magic in minutes. Guests enjoy watching each eSketch take shape on a nearby large display. Once your eSketch is finished, the artist prints out your very own color copy to take away with you. In addition, we provide all our clients with a link to all the eSketches™ that were drawn during their event. They can share them with their guests and clients as well as post them to their social media accounts like Instagram and Twitter! If you want to add a cutting edge artistic element to your next function or event, give us a try. You can fund an artist and see rates by searching our directory. Watch our sample video below to get an idea just how fun and unique eSketches™ are! I am very happy and relieved to report an update to my previous post about my close friend and great artist, Glenn Ferguson. As many of you already know, Glenn was viciously attacked by another artist at Universal Studios on New Year’s Day. Glenn was stabbed in the side of his head with a pair of scissors near the caricature stand that he has been drawing at for over 20 years. It took over 5 hours of surgery to remove the blades from his brain. All of us in the caricature artist community were horrified when we learned of Glenn’s situation. Glenn is highly respected and greatly loved by many of us who share his trade of drawing caricatures for a living. A few of us organized a GoFundMe campaign to help offset all the costs and lack of income that Glenn was enduring while he is recovering. People from around the world have reached out with support and donations. So far, we have successfully raised over $67,000! Miraculously, Glenn regained conscious a couple weeks later. However, that was only the first step. He has had a tough road since then. The injury affected his vision, speech and the vital functions that most of us take for granted daily. He was unable to understand what people were saying to him. He couldn’t walk. He didn’t know how to speak. Imagine waking up and not even knowing who you are. That’s exactly what Glenn experienced. Fortunately, the wonderful therapists worked with Glenn in the hospital for weeks and were surprised at how quickly he responded to treatment. They had never met nor worked with someone like him before. Being an artist meant that his brain is wired a little differently than most people. And the therapists were learning a lot from Glenn while helping him recover. Glenn progressed well enough that the hospital discharged him ahead of schedule and sent him home. Now Glenn is working with his therapists from home several times a week. He is learning to read again. He still gets tired easily and he has no peripheral vision in his right eye. But the Glenn we all know and love is alive and hasn’t changed regarding his personality. That is a huge victory! It’s incredible to think that only 45 days ago, Glenn was clinging to life by the smallest of odds. I am as blown away with his progress since then. Glenn has been overwhelmed regarding your compassion and support. As I mentioned before, Glenn is really one of the good ones and apparently greater forces than ours appear to agree. Keep up the great recovery, Glenn!